Bank Top looking towards Whalley Banks, with the steeple of Chapel Street Congregational church (I think that's what it's called) in the distance. The dark coloured building, prominent on the right side of the street, is the former Shakespeare pub, which I believe took its name from a mill that once stood somewhere behind it. The name is still with us today, as I'm sure Shakespeare Way is around that way somewhere, behind St Wilfrid's School. 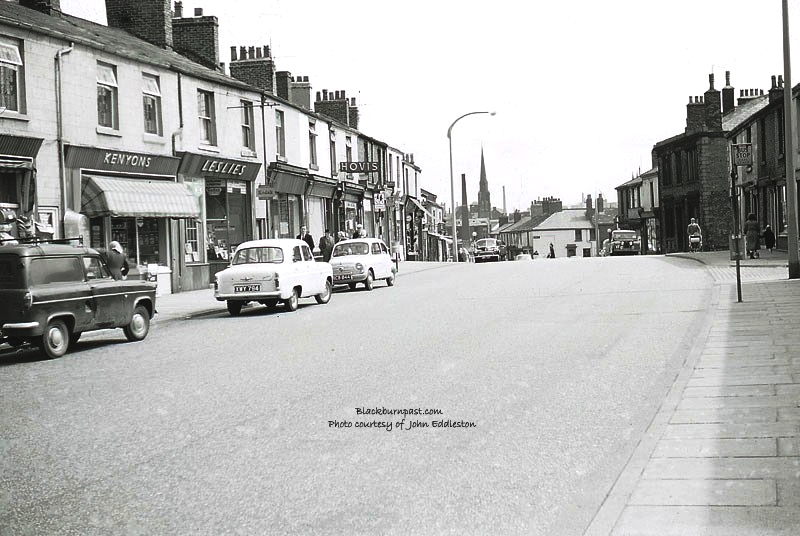 Shakespeare St ran parallel to Preston Old Rd in front of Shakespeare Mill from Lyon St to Duckworth St. The Shakespeare pub is on the corner of Wellesley St with Lord Byron St the next street coming towards the bus stop. Radcliffe and Hamlet Streets also came off Shakespeare St.
As kids if we came home from "Town" on the bus, it was 2d to "Griffin" but only three ha'pence if we got off at "Shakespeare"
Thanks for the info Bank. I have a couple of street maps/plans, but couldn't be bothered getting them out to check at the time I was uploading the photo, as I'm not sure people are actually reading the captions most of the time. It's good to see that someone is. A long-shot but I've been trying to discover specifically which (street number) of the (still standing) premises on Bank Top used to be occupied in the mid-late 1960's, by a very old lady who was known to all her customers simply as "Mrs H". If I recall correctly, the shop was a very small "general store", but as the first intake (1966) of school kids from the recently opened St. Wilfrids, across the road, our main interest was in the various sweets that could be had, along with frothy Vimto, the likes of which I've never seen sold anywhere else - either before or since! - and dispensed from a weird looking machine on the counter. The shop was tiny inside, but had a small table and a few chairs around which we all used to sit whilst drinking our Vimto and discussing the day's (to us) major topics with Mrs H.! I've looked in the trade directories and street directories but have drawn a blank. If anyone out there knows which premises number it was, or Mrs H's full name (which might help with any further searching), I'd be greatly obliged. Regards, Mike Valentine. (ex Wilfridian!). I grew up and lived in the area,starting at Witton Park High in '66 as a first year as you did. My memories of Whalley Banks are different to that you describe. I recall that Kenyon's had a double fronted shop accross from St Wilfreds(next to Norman Taylors shoe shop). A hardware shop connected to next doors sweet shop. The shop which you describe, sounds just like the "pop shop" on Witton stocks or Redlam rather, past Witton Inn at the busstop, Right at the junction with what would be Selbourne mews. Stainless steel contraptions dispensing "fizzy" or otherwise Sarsaparilla, Lime or Raspberry Pints which could be "downed" at a cast iron pub table and chairs in an adjoining room in the triangular end of the building. It can still be seen in the compare and contrast section of this wonderful site. If you find different info, please post it to help with braincell refreshment.